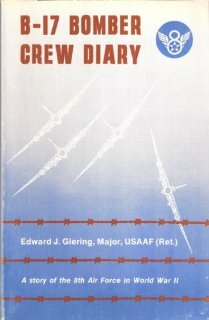 I recently came across the book B-17 Bomber Crew Diary by Edward J. Giering, Major, U.S. Army Retired, as part of my research on B-17 planes for my own memoir. Sure, I had looked up the B-17 fact sheet, and read the details of the various B-17 plane models in reference books. However, it was Giering’s account that I found much more enjoyable! The book didn’t just provide an account of a somewhat fictionalized B-17 crew, but allowed me to identify with the author, and his characters, on numerous levels. First, Giering wrote a foreword that detailed his ambition for his story. “This story was written with the intention of presenting a bit of the flavor and life of a World War II bomber crew of the Eighth Air Force, ‘The Mighty Eighth’.” I found Giering’s words honest to the core. Aren’t all memoir writers trying to communicate the same? We’re not trying to become best-selling authors. We’re only trying to share. Second, Giering was clearly discouraged from his pursuits. “…I was advised that there was not much market interest in amateur writings concerning the Second World War.” Major, I feel your pain. I’ve heard too many times that memoirs should be written “just for the family.” I’m not sure why fictional stories should demand more of an audience. If true stories, and fictional stories are equally good, then both deserve attention. I’m curious what people would say if I suddenly declared that I was writing a novel. Third, Giering described the roles of the B-17 crew in-flight, the layout of the plane, the intelligence briefings before a mission, and the experience and emotions of the men while flying bombing missions over Germany. The tiny little details were remarkable. My favorite passage (p.35) described the need for the gunners to keep a lookout for enemy planes, while they passed the hours on the way to the target. “The steady hum of the engines produced a sleepy effect on the gunners, whose main task was to sit and look at the vast expanse of sky and earth. The droning sound filled the ears, the mind, and finally the eyes, pulsing and throbbing as though a part of the bloodstream….guns dropped sleepily from one ill-fated bomber. ‘Gunners asleep at the throttle,’ it announced to those who sought an opening. ” Somehow, I can imagine a professional editor commenting “unnecessary detail.” However, to me the threat that Giering recalled was more significant. My Dad was a tail gunner, and while he never saw duty overseas, I wondered whether he would have had the stamina to stay awake. Fourth, the second half of Giering’s book described the crew’s ordeal after their “flying fortress” was shot down. While some crew members were killed in the air attack, others bailed out, and became POWs (prisoners of war) in a German POW camp. From capture, to interrogation, to imprisonment, and hunger, I found Giering’s details both poignant and familiar. My father’s cousin, Donald Bissonnette, piloted a B-17, and faced the same circumstances. I had heard a similar story before, and appreciated that Giering had documented a sliver of wartime history that so many men had experienced. I feel lucky to have stumbled upon “B-17 Bomber Crew Diary,” and found that I connected with the author and his words in a special way. I’m glad that Giering overcame the initial negative reaction to his memoir goals, and both wrote and published his story. He documented a slice of history that so many shared, including me, albeit a generation later. My only regret now, is that I have to return the book to the library. Isn’t it great to know that the history has been recorded for all future generations to learn. Absolutely! The man who wrote this book probably didn’t know how valuable it would be to the future generations. But we do, and that’s just as important.